The recent 60 Minutes interview with Supreme Court Justice Antonin "Nino" Scalia was eye opening on many fronts. First, when did Leslie Stahl morph from a pit bull into a gushing school girl reporter? These weren't even softball questions: They were valentines lobbed his way. Stahl could easily sub in for one of the local sports "reporters" whose questions tend to be along the lines of "Gee, Jon Lester, how awesome were you in hurling your two hitter tonight?" Such questions must be the price paid for what CBS billed as a "remarkably candid" interview. Did they mention that the Justice has a book to sell? ALso it's great to be remarkably candid when confronted with your perfect straight-A school days and other evidence of your flawless intellect. More importantly, was the judge, who's noted for a fierce intellect who seemed much more a semanticist. He challenged the notion that torture is "cruel and unusual punishment." His retort: "Has anyone referred to torture as punishment? I don't think so." "Hurting him to get information is not punishing him." Bet the guy getting waterboarded would beg to differ. Probably literally. Scalia is the perfect judge for the Bush regime: Just keep saying something loud enough and long enough and it must be true. But say Scalia, parsing his words, is technically correct. Further, allow that punishment is aimed at teaching transgressors a lesson and so is reserved for post conviction imprisonment: Then you have to be found guilty in order to be punished. One small problem: None of these people seem to be getting a real trial. We're torturing non-convicted people who may never come to trial and so never get convicted. Given that, the prosecutors/investigators are getting their licks in now. Comedy Central's Jon Stewart weighed in on this and on Scalia's comment that people should "get over" the Bush-Gore Supreme Court finding because it's so "old already." Got an email that Bryant Gumbel has declined to continue in his role as NFL Network guy. Geez, some of us just realized he was there. Yeah,yeah, healthier. But how will it taste? Sign of the times: Kelly's Roast Beef, home of the area's best greasy-but-delicious fried clams is eliminating trans fats. If you want your artery-clogging hydrogenated cooking oils, you better start avoiding your major emtro areas. Boston is joining NY, Philly and Brookline, Boston's always self-satisfied neighbor, in banning their use starting in September. Speaking as one of the millions scarred by the 1986 Series, I never held it against Buckner. He hit a a ton even though he could barely walk. He should never have been left in the game for the infamous grounder. There were lots of facets to that loss. 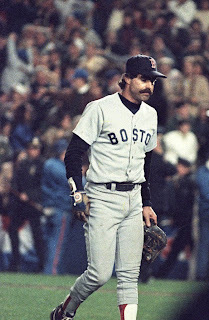 Contrary to myth, Buckner got a warm ovation from the gazillions at the Boston parade for the near-champions. (Only Boston throws parades for losers, but that's another topic.) An ovation compelled him to speak at the City Hall Plaza finale. given the morons around here, things went downhill for Buckner in Beantown after. You can't blame him for decamping to Idaho. Others have started Forgive Buckner groundswells in the past. He has nothing to be forgiven for but it'll still be nice to have him back at the fens. So alleged terrorists were going to use Tang and hydrogen peroxide to bring down airliners. No kidding. It was on NPR tonite and online here. A British reporter covering the UK trial said that scientists working from the terrorists' plans were able to set off a pretty scary explosion. That plot involved the aforementioned fruity orange drink powder (possibly the most famous byproduct of the US space program), hydrogen peroxide, plastic soda bottles, hypodermic needles, glue and batteries. Now we know why we can't carry large bottles of liquid onto planes anymore. Makes you rethink all those Mentos and Diet Coke tricks don't it?